Launch of NovaSAR-1 and SSTL S1-4 onboard the Polar Space Launch Vehicle. Image courtesy of ISRO-Antrix. It’s been a bit of rollercoaster week for the UK Space Industry. 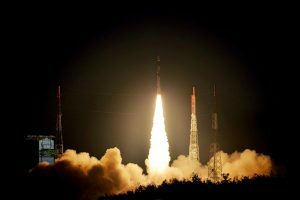 The positive news is that on Sunday, 16th September, at 16.38 GMT two UK satellites were launched onboard the Polar Satellite Launch Vehicle (PSLV) from the Satish Dhawan Space Centre in Sriharikota, India by by Antrix Corporation Limited, the commercial arm of the Indian Space Research Organisation. These were NovaSAR-1, the first Synthetic Aperture Radar (SAR) satellite to be entirely made in the UK, and the SSTL S1-4 an optical Earth observation satellite. The satellites had a combined launch payload of approximately 889 kg and they were put into 583 km sun-synchronous orbits. ScanSAR mode with a swath width of up to 100 km at 20 m spatial resolution. Maritime surveillance mode with a swath width of > 400 km and a spatial resolution of 30 m.
Stripmap mode with a swath width of 15-20 km and a spatial resolution of 6 m.
ScanSAR wide mode with a swath width of up to 150 km and a spatial resolution of 30 m.
The maritime mode has attracted a lot of interest as the satellite payload also includes an Automatic Identification System (AIS) system to monitor ships positions. These two instruments provide an opportunity to monitor illegal fishing, smuggling and other activities; particularly for any vessels who turn off their AIS. SAR satellite images are not affected by clouds and can be used to monitor the ocean at night. In addition, the data from this satellite will also be used for flood monitoring, crop assessments, forestry monitoring, land use and land cover mapping and supporting disaster management. NovaSAR, which had been due to be launched earlier this year, is of particular interest to Pixalytics, as a few years ago we were involved in a project where we simulated NovaSAR-S data and so we’re really excited to see what the data actually looks like and how close our simulations were! SSTL-S1-4 is a high resolution optical satellite offering a spatial resolution of less than 4 m in multispectral mode, and sub-metre resolution in panchromatic mode. It’s identical to the existing SSTL DMC3 constellation launched in 2015, and this additional satellite will improve the temporal resolution and revisit time. The images will be provided to Twenty First Century Aerospace Technology (21AT) of China and the data used to for urban planning, crop yields, pollution monitoring and biodiversity assessments in that country. UK will no longer play any part in Galileo or the European Geostationary Navigation Overlay, and so UK-based business will no longer be eligible to bid for future work, and any companies with existing contracts will need to discuss their withdrawal to avoid penalties. UK will no longer be able to play a part in Copernicus, and again no UK-based business can bid for Copernicus work, and any existing contracts will need to be discussed. UK users will lose access to data from Copernicus Contributing missions, and could lose the right to high-bandwidth access to the standard data from the Copernicus Sentinels. UK will not be eligible to participate in the EU Space and Surveillance and Tracking programme (EUSST), and any company with existing contracts should discuss these. Clearly these relate to specific space programmes, nonetheless there are businesses in the UK who will need to deal with the consequences of this should it happen. Worse though, with only six months to go there is real lack of clarity on everything businesses need to do to operate, i.e., export rules, tax regimes, etc. Bland government statements and documents are not helping resolve the situation. We hope the UK Government and EU will manage to reach an agreement to avoid the no-deal option. However, as an innovative business in a growing sector we, and the broader UK space community, can’t simply wait and see what happens; instead we all continue to search out and pursue new opportunities. This entry was posted in Copernicus, Data, Earth Observation, Policy, Remote Sensing, Space Industry, Supporting Activities, UK Space Industry and tagged Brexit, china, Copernicus, Earth Observation, EO, European Union, exports, Galileo, high resolution, launch, maritime surveillance, No-Deal, NovaSAR-1, optical, S band, SAR, Satellites, SSTL, SSTL S1-4, Surry Satellite Technology Limited, Synthetic Aperture Radar, Technical Guidance Note, UK by Andy. Bookmark the permalink.